I. The allocation of state quota seats for various courses will be done as per the reservation policy of the State Government as notified vide Notification No. 01/T.E./HRDD/2014 dated 14th June 2014. The allocation for MBBS, BDS & Allied courses and Engineering & Allied courses shall be purely as per the category/community wise merit list drawn on the basis of the marks obtained in the Common Entrance Test and subject to criteria as laid down by the Medical Council of India, concerned Institute and other authorities from time to time. For the academic session 2016-17 Sikkim Manipal University has provided 30% MBBS seats out of their total intake. Of this 30% seats, 20% will be on concessional fee and 10% will be on full fee basis. The seat matrix for the concessional seats will be drawn as usual alongwith other available seats. However, for the seats with full course fee seat matrix will be drawn separately duly following the reservation and roster policy of the State Government. For Non CET courses, allotment will be made as per the merit list drawn on the basis of the marks obtained in the qualifying examination and subject to criteria as laid down by the concerned Institute/other authorities from time to time. In case of candidates having obtained similar marks in CET the weightage will be given to marks obtained in relevant subjects in the qualifying examination. Incase the marks obtained in the relevant subjects are also same; weightage will be given to marks obtained in English. The candidates’ selected in each of the categories would be given option to choose a seat of their choice in accordance with their merit position in that respective category. For instance, a candidate who is first in the merit (open category) will be given first choice. Thereafter, a candidate who has secured 1st position in B.L. category would also be given an option to choose a seat of his/her choice. Likewise candidates securing 1st position in order of merit in Primitive Tribe, OBC (Central), OBC (State), ST and SC category respectively, would also be given their choice. Thereafter, the allotment and choice of seat will be given to those candidates who are entitled and next in the merit in their respective category. This cycle will operate till the candidates belonging to all categories, excluding ‘Others’, are allotted seats as per their entitlement on the basis of seat matrix. In case seat(s) belonging to any category remains vacant due to candidates not fulfilling criteria for the course as mentioned at para I above or there is no candidate belonging to that category to avail the seat the vacant seat will be allotted to the candidate who is first in the merit at that point of time irrespective of community. III. The BPL candidate selected under 12% horizontal reservation will be accorded priority on choice of college/institute over the candidates of concerned reserved category/community. In case where horizontal reservation does not add up to one seat in a particular year due to less number of seats available for allotment to a community, the percentage of horizontal reservation of that year will be carried over and added to the next year and to another year till it add up to a percentage which enable reservation of one seat and that seat will be allotted to the BPL candidate in that particular year. The same principle will be followed for the following years too. IV. If any candidate fails to be present when his/her name is called on the day of the counselling or does not opt to avail seats available in the first counseling he/she will be allowed to attend subsequent if any, counseling. However he/she will be eligible for allotment of only those seats which are available in that particular counseling. V. Candidates who are availing the Non CET State quota seats and has passed in the qualifying examination in the current year will have preference over the candidates who have passed the examination in previous years. Same principle will apply for candidates who have passed prior to previous years. VI. The Certificate of Identification issued under Category 5 of the Notification No. 57/Home/96 dated 27th September 1996 is issued only for the purpose of employment. 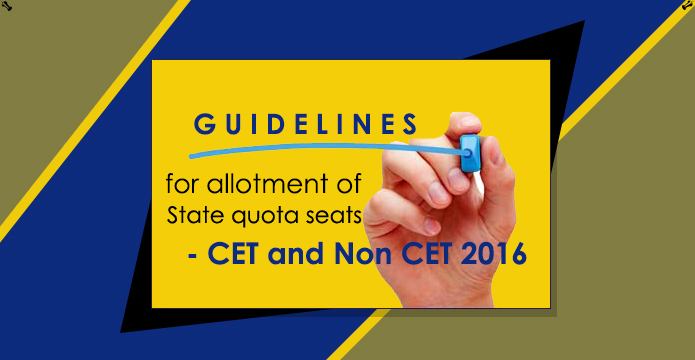 Therefore, the same will not be considered for allotment of State quota seats. (a) Business community – Valid trade license in the name of the father. (b) State government employees – A certificate signed by the Head of Department stating that the candidate’s father/mother is in regular government service of the State Government. (c) Copy of Mother’s SSC/COI certificate. (d) Creamy Layer candidates –SSC/COI certificate of the candidate or his/her father. VIII. Once a seat is allotted and availed by a candidate, he will not be entitled to any other State quota seat even if the State quota seats allotted earlier is surrendered by him. IX. For issues not covered by this guideline which may come up at the time of allocation of seat, the decision of the Director, Technical Education shall be final and binding. The Director, Technical Education shall, however, ensure that his decision is based on facts which are reasonable and fair. FOR MORE INFORMATION VISIT OUR OFFICIAL WEBSITE www.besonline.in.